The grocery store can be a pretty overwhelming place. Especially with all the health trends these days. It can be hard to navigate what you really need and what is just extra. I think this is different for everyone but I can confidently say that I've found a handful of items that are absolutely non-negotiable in my kitchen. If I don't have even one of these things I'll usually make a trip to the grocery store. Most of the items on this list are real foods in their purest form, but there are also a small handful of supplements and extras that I find to be highly effective and extremely beneficial for me. Meaning I've been using them on a daily basis for months and can honestly say that they have made a difference in my health. Below I list all of my must have items and then I lay out how I use them in a typical day. -I start every morning with a large glass of room temperature water. Sometimes with lemon but usually just plain old water. We have a water delivery service that delivers 5 gallon bottles to us every couple of weeks. This has been extremely convenient considering the large amount of water we drink. It's also a major goal of mine to limit any and all plastic bottle purchase. -Next up is my favorite time of day. Matcha time! 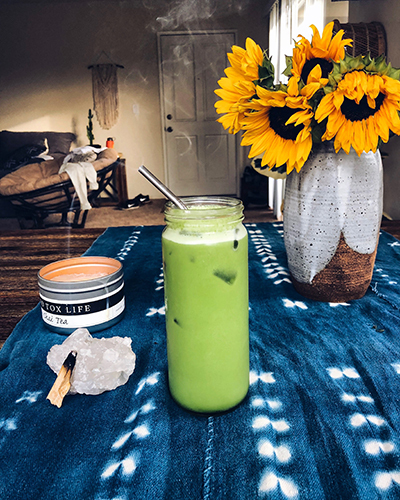 My go to recipe is simple, 1 tsp matcha powder, 1 tbsp Brain Octane Oil and 1 scoop collagen peptides mixed with 12oz of water and 4oz of nut milk, blended then poured over ice. I find that the protein in the collagen powder and the healthy fats in the brain octane oil keep my blood sugar levels feeling really stable. -I always listen to my body and eat when I feel hungry. With my current routine, that typically isn't until 10:30 or 11am. Going longer in between meals has worked wonders for my digestion, I no longer suffer from any of the stomach issues I once had. 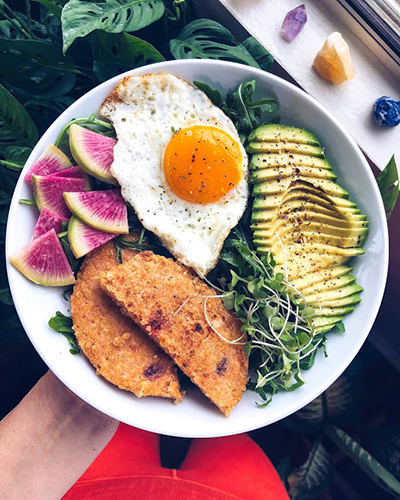 When I start to feel hungry I'll usually make a big breakfast bowl with lots of organic greens, eggs, avocado, and a carb source (usually roasted sweet potatoes.) This mid day meal always has me feeling full and satisfied for hours. I've found that limiting my sugar intake for the first half of the day keeps my energy levels and my appetite really stable. -If I'm still feeling hungry a couple hours after lunch or just want a mid day pick me up I'll usually make myself a protein rich chocolate milk. This recipe is low in sugar yet satisfies my mid day sweet tooth every time. -If I'm still feeling hungry or if I have a really active day i'll make a chia seed pudding with coconut yogurt, nut butter and berries. - I work evening shifts most nights so I like to have ingredients on hand that are really easy to prepare and don't take much time. My go-to post work meal is grass fed ground beef with romaine lettuce, tomatoes, avocado, lots of micro greens, Kite Hill cream cheese and a Hilary's veggie patty. Having these items on hand ensures that I can always whip up a homemade meal that is balanced and packed with nutrients. Most of my meals are simple and take little very little preparation. Simplicity is key! I love a good homemade cocktail, I often opt for having drinks at home before going out to ensure that I get a tasty drink with some added health benefits, while avoiding high prices and lots of added sugars. I like to use lots of lemon and lime plus freshly juiced fruits and veggies for added nutrients. For this recipe you will have leftover juice, you can store it in the fridge in an airtight container for up to a week. In a juicer, juice carrots, limes and oranges. Fill a glass jar with ice, tequila, 1/2 cup juice mix and water. Stir well and garnish with fresh carrot sticks, rosemary and lime slices. 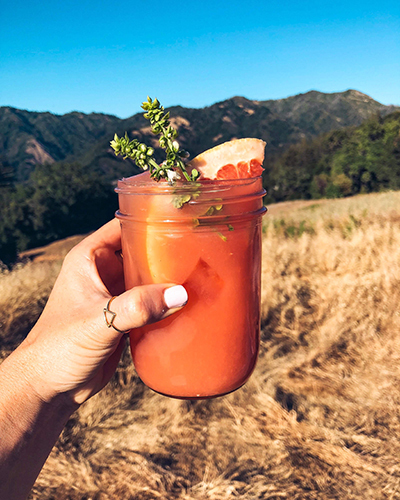 Fill a 16oz mason jar with with ice, add watermelon juice, lime juice and vodka. Fill the remainder of the jar with water and stir well. Garnish with thyme and lime slices. 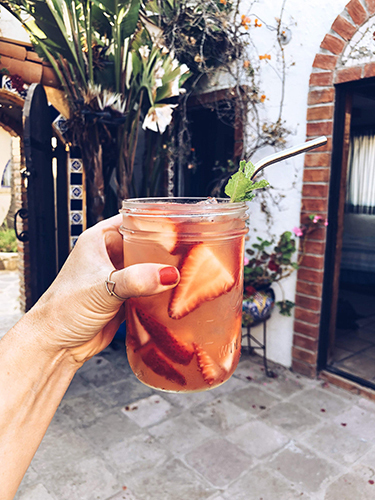 Muddle strawberries in the bottom of a glass mason jar. Fill jar with ice, lime juice, tequila, maple syrup and water. Stir well and enjoy! Everything you've heard about bulletproof coffee is true. It kills cravings, aids in weight loss, boosts cognitive function and tastes buttery and amazing. Two key ingredients for your morning bulletproof are Bulletproof brand Brain Octane Oil and grass fed ghee or butter. Brain Octane is a strain of coconut oil containing caprylic acid. The body rapidly metabolizes caprylic acid into ketones that the brain can use for instant energy without the need for glucose from sugar or carbs. Grass fed butter or ghee helps neutralize acidity in coffee making it easier on the gut lining and it's high fat content feeds the brain increasing focus and mental clarity. While these two ingredients make your drink "bulletproof", the possibilities for other add-ins are endless. 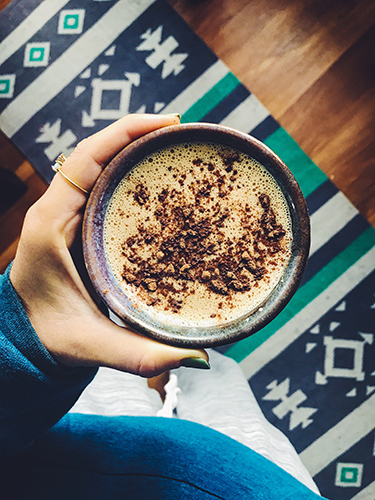 Some of my favorite things to add to my morning drink are collagen protein, cinnamon and adaptogens like ashwagandah, maca and cacao powder.